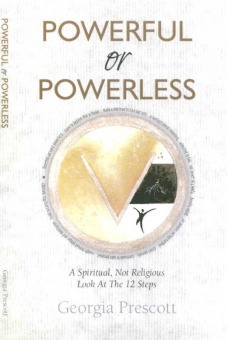 Join Dr. Harry as he welcomes Reverend Georgia Prescott, author of “Powerful or Powerless” to The Moses Show. People confused by how to admit powerlessness over their addiction and become powerful in their lives. Spiritual coaches who are dealing with people who don’t want to name and claim a disease. People who don’t want any part of the God stuff. Family and friends of alcoholics who aren’t ready for sobriety yet. Click onto button below to listen to the talk live and to call in with questions and comments or click and listen to the show anytime after first airing. Just bought your fascinating text, POWERFUL OR POWERLESS. I’m excited about entering your Religious Science background world and finding solace therein. I seem to recall you speaking at Rev. Edward’s church in Santa Rosa. True? Anyway, blessings, dear, on a literary journey with cosmic implications! Everyone interested in self-improvement should buy and study Rev. Prescott’s book. You’ll not be disappointed!